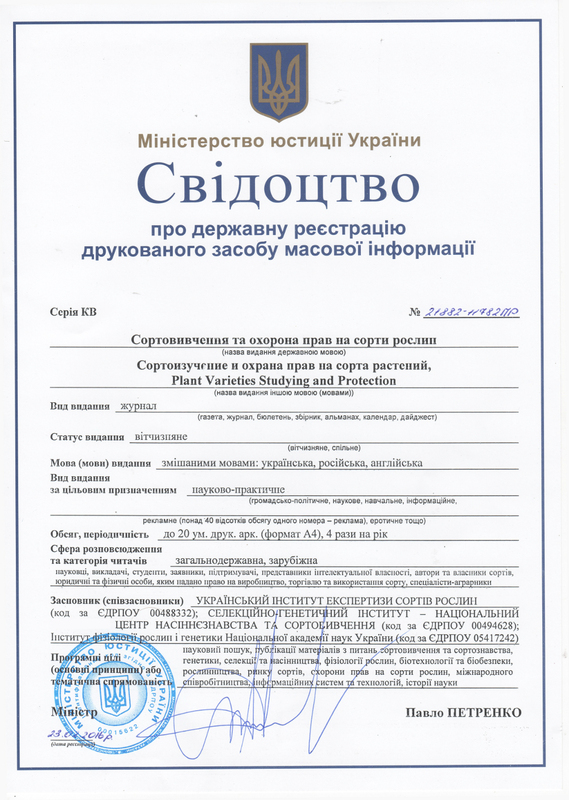 Plant varieties studying and protection has been registered by the State Registration Service of Ukraine as a countrywide print mass media. AGRIS is the service that connects you directly to a wealth of research and technical information on agriculture worldwide. AGRIS is the International System for Agricultural Science and Technology providing access to bibliographic information on agricultural science and technology. It offers more than 8,9 million links to information produced by more than 350 data providers (which include research centers, development programs, international and national organizations) from more than 140 countries. Since 1975, AGRIS is maintained by the Food and Agriculture Organization of the United Nations to serve users from developed and developing countries through facilitating access to available knowledge in agriculture, science and technology. AGRIS facilitates access to publications, journal articles, monographs, book chapters, and grey literature - including unpublished science and technical reports, theses, dissertations and conference papers. Most AGRIS records are indexed by AGROVOC (the FAO multilingual Thesaurus) and this enables similar content to be retrieved through Google Scholar and to interlink with other related resources on the web. While AGRIS is predominantly a bibliographic repository, if a link to the full text of the AGRIS resource is available online, this will accessible via the AGRIS portal. Currently about 1,8 million records have an access link to the full text. On average, some 400,000 agricultural and research professionals worldwide access AGRIS resources each month. Index Copernicus Journals Master List is a scientific journal database that contain currently over 13,000 journals from all over the world. This database covers all fields of science. Registered journals undergo rigorous, multidimensional evaluation, proving high quality. Appreciation to the IC Journals Master List expressed the Ministry of Science and Higher Education of Poland by placing the database of scientific journals IC Journals Master List to the list of databases for indexing in which, periodicals receive additional points in the evaluation conducted by the Ministry. Российский индекс научного цитирования (RINC) is a research and information system accumulating over 6 million publications of Russian authors as well as information on quoting these publications from more than 3000 Russian and CIS journals. It is designed not only for operational support of research activities by up-to-date reference and bibliographic information but also it is a powerful tool allowing to assess the effectiveness and efficiency of research organizations, scholars, the level of academic journals, etc. The CIARD RING is a project implemented within the Coherence in Information for Agricultural Research for Development (CIARD) initiative and is led by the Global Forum on Agricultural Research (GFAR). The RING is a global directory of datasets and data services for agricultural research for development (ARD). It is the principal tool created through the CIARD initiative to allow information providers to register their services and datasets in various categories and so facilitate the discovery of sources of agriculture-related information across the world. The RING aims to provide an infrastructure to improve the accessibility of the outputs of agricultural research and of information relevant to ARD management. Elektronische Zeitschriftenbibliothek (The Electronic Journals Library) is a service to facilitate the use of scholarly journals on the internet. It offers a fast, structured and unified interface to access full-text articles online. It comprises more than 89900 titles from all areas of research, about 18300 of which are available online only. In addition, more than 104800 journals, which are provided by aggregators, are listed. The EZB contains 56743 journals which are accessible free of charge to anyone. Furthermore, the participating libraries provide their users access to the journals they subscribe to. The journals are presented in lists sorted by research area. An updated list is generated by the database according to the member library's specifications each time it is accessed. The Electronic Journals Library was founded in 1997 by the University Library of Regensburg in co-operation with the University Library of Technische Universität München. PKP Index is the project of Public Knowledge Project (PKP). The PKP Index is a database of articles, books, and conference proceedings using PKP's free, open source Open Journal Systems, Open Monograph Press, and Open Conference Systems software applications. The PKP Index includes more than 322000 records indexed from 1000 publications. The Index covers all subject areas and includes content from publishers from around the world. To be accepted into the Index, your journal, press, or conference site must include at least one article, chapter, or proceeding. The index is a curated list of publications and all submissions are reviewed and approved by PKP staff. The PKP Index is powered by PKP's own Open Harvester Systems. Please use the link to register http://index.pkp.sfu.ca/index.php/user/register for an account. ResearchBib - Academic Recource Index Academic Recource Index — the product of ResearchBib. ResearchBib is open access with high standard indexing database for researchers and publishers. Research Bib may freely index journals, research papers, call for papers, research position. Journal Indexing. ResearchBib tries to cover all open access scientific and scholarly journals freely. The ResearchBib Journal Database is the largest complete journal database available on the internet freely. Journal Database try to cover all open access scientific and scholarly journals that use an appropriate quality control system, and it will not be limited to particular languages or subject areas. The Journal Database contains 420,000+ journals from different publishers, which includes the title, abbreviation, journal host url, index, publisher, description (aims and scope), online ISSN and print ISSN etc. CyberLeninka — Scientific Electronic Library is open access (Open Access), whose main objectives is to promote science and research activities, public control of quality of scientific publications, the development of interdisciplinary research institute of modern scientific review and improvement of Russian science citation.